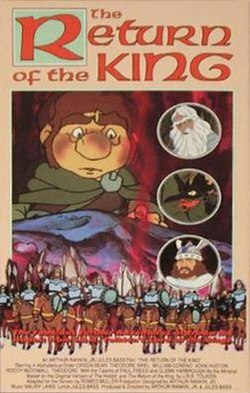 The Return of the King (also known as The Return of the King: A Story of the Hobbits), is a 1980 animated musical television film created by Rankin/Bass and Topcraft. The film is an adaptation of The Return of the King, the third and final book in The Lord of the Rings by J. R. R. Tolkien. Due to marketing by Warner Bros., the film is often credited by fans as the unofficial sequel to Ralph Bakshi's 1978 animated film The Lord of the Rings, which is based on the first two volumes of the book. According to rumors, Rankin/Bass decided to do the project upon hearing that Bakshi's sequel finishing The Lord of the Rings was going to be left unmade. However, Rankin/Bass had always planned on making a sequel based on The Return of the King as their follow-up project to The Hobbit. The special aired on ABC on Sunday, May 11, 1980. Critical and fan reaction to The Return of the King was lukewarm. During the 111th birthday celebration for Bilbo Baggins in Rivendell, Frodo begins his story with Samwise Gamgee, his friend and companion, treading through Mordor as Ring-bearer in Frodo's absence, when Frodo is captive in the orc fortress of Cirith Ungol. During his journey, Sam ponders claiming the Ring himself; but rejects the idea and rescues Frodo. Meanwhile, the wizard Gandalf the White and the hobbit Pippin arrive at Minas Tirith to warn Denethor, the Steward of the Throne, about the upcoming war—only to discover that the Steward has become insane and means to take his own life. Frodo and Samwise continue toward Mount Doom (eluding Ringwraiths and infiltrating a "battalion of orcs" in the process) only to be attacked by Gollum. As Sam holds Gollum off, Frodo reaches the Crack of Doom; but is subverted by the Ring. At the same time, Gondor's neighboring country, Rohan, helps it claim victory in the Battle of Pelennor Fields, where King Théoden and the Witch-King of Angmar are slain. Upon his own arrival, Aragorn plans to confront Sauron at the gates of Mordor. Here, he quarrels with the Mouth of Sauron and the two armies prepare for battle. After days of searching for Frodo in Mount Doom, Sam discovers Gollum and Frodo fighting over the Ring, which results in Gollum biting off Frodo's finger to claim it. While dancing with joy at the retrieval of his "Precious", Gollum falls into Mount Doom's magma chamber, taking the Ring with him, and Sauron perishes. Sam and Frodo are rescued by the Eagles from the erupting Mount Doom. A few months later, Aragorn is crowned King of Gondor. The story concludes with Frodo agreeing to accompany Bilbo, Gandalf, and Elrond as they leave Middle-earth. He gives the Red Book (consisting of Bilbo's memoirs with some spare pages) to Sam, assuring him that a good life is still in store for him. Gandalf assures them that hobbits shall someday have descendants among humans, to preserve their own existence; and the film terminates in Frodo's departure from the Grey Havens. After the broadcast of The Hobbit on ABC, development and production began on The Return of the King at Rankin/Bass Productions in New York City under supervision of Arthur Rankin, Jr. and Jules Bass. The film's original working title was Frodo, The Hobbit II. It was written by Romeo Muller with Rankin doing the script, designs for the characters and storyboards. The original cast from the previous film returned to reprise the voices of the characters with new actors joining them. Orson Bean returned as the voice of the older Bilbo Baggins, as well as that of the story's hero, Frodo Baggins. John Huston came back as well, as the wizard Gandalf, and co-starring with them were: William Conrad as Denethor, Roddy McDowall as Samwise Gamgee, Theodore Bikel as Aragorn, and reprising his role of Gollum, Brother Theodore. Rankin/Bass stalwart Paul Frees replaced the late Cyril Ritchard as the voice of Elrond; Casey Kasem, best known for his role as Shaggy in Hanna-Barbera's Scooby-Doo, was Merry, with Sonny Melendrez as Pippin; Nellie Bellflower as Éowyn; and Glenn Yarbrough returned as principal vocalist, billed here as simply "the Minstrel of Gondor". Thurl Ravenscroft also served in the chorus. Once the character voices were recorded, along with background music by Maury Laws with Jules Bass writing songs and lyrics for the film, the animation production was done by Topcraft in Japan under supervision of Toru Hara, Tsuguyuki Kubo, Kazuyuki Kobayashi and other animation department members. The film was going to air on ABC as a two-hour feature in the fall of 1979, but it was pushed back to May 1980, and the running time was changed from two hours to one hour and 38 minutes. The film has garnered mixed reviews from modern sources. Charles Cassidy of Common Sense Media gave it a score of 3/5, and said, "Cartoon tale is darker, more complex than others in series". Steven D. Greydanus of Decent Films Guide gave it a C, and said, "Works even less well than The Hobbit, which really is a children's story… overbearing folk-ballad soundtrack doesn't even gesture lyrically to Tolkien's poetry". It currently holds a score of 67% on Rotten Tomatoes. In the absence of an official sequel to Ralph Bakshi's The Lord of the Rings, The Return of the King has come to be marketed by Warner Bros. as the final part of a loose animated Tolkien trilogy preceded by The Hobbit. The middle film is very different in tone and character design, however, and the final two films do not join up seamlessly, as both omit various segments from The Two Towers, most notably regarding the events in Shelob's lair. Other omissions in the Rankin/Bass version include the characters of Gimli, Legolas, Arwen, and Saruman. Aragorn is present but he has very little dialogue or screentime. The Return of the King was first released on VHS by Warner Home Video in 1991, and for the second time as part of the "Warner Bros. Classic Tales" video collection in 1996. The film has been available on DVD since 2001, both individually and as a "boxed trilogy" with the Rankin/Bass's The Hobbit and Bakshi's The Lord of the Rings. It was re-released on a Remastered Deluxe edition DVD on July 22, 2014. ^ Cassady, Charles. "The Return of the King (1980)". commonsensemedia.org. ^ Greydanus, Stephen. "The Return of the King (1980)". decentfilms.com. ^ "The Return of the King". rottentomatoes.com. Screen captures from the CED edition. Also features links to galleries of screen captures from other Tolkien animated films.